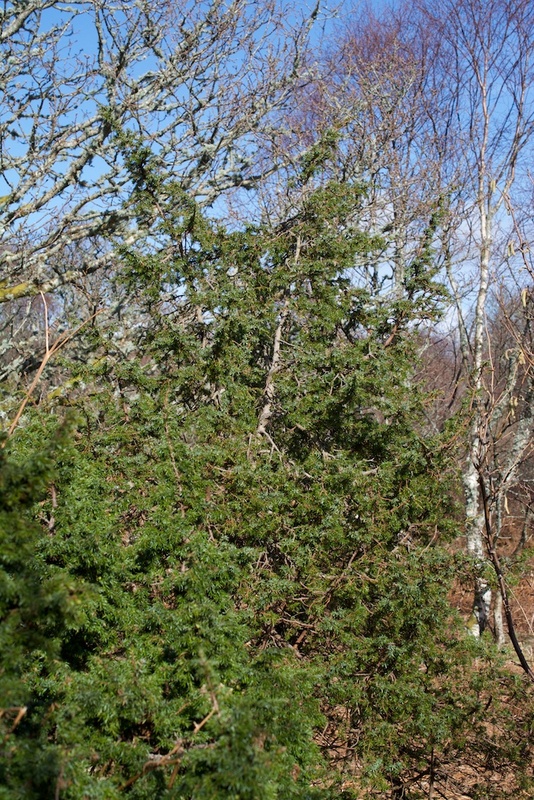 One of the most important trees in the Caledonian forest is also one of the most frequently overlooked: the juniper (Juniperus communis). 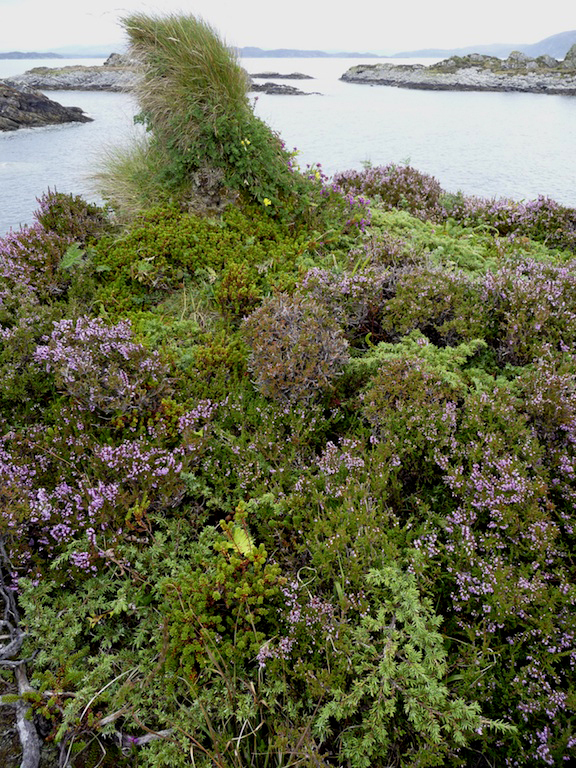 The juniper doesn’t really look like a tree at all, presumably because at some stage in its evolution it decided to take the path of least resistance and started hugging the ground in the face of relentless Atlantic gales. It is a ‘pioneer species’, preferring open spaces to germinate, and disliking shady conditions – and while this means that it gets a good dose of sunshine, it is also vulnerable to the worst extremes of weather. Juniper is one of Britain’s three native conifers (Scots pine and yew are the others). It is thought to have spread here as the ice retreated around 12,000 years ago, seizing the opportunity of newly exposed earth and relying on its sharp needles for protection against grazing animals. As the woodlands grew up around it, the abundance of juniper may have taken a dip until Neolithic settlers started to make clearings in the forest, opening up new space for the cycle to begin again. According to Trees for Life, common juniper has the widest distribution of any woody plant in the world, ranging right across the northern hemisphere from western Alaska to Japan. 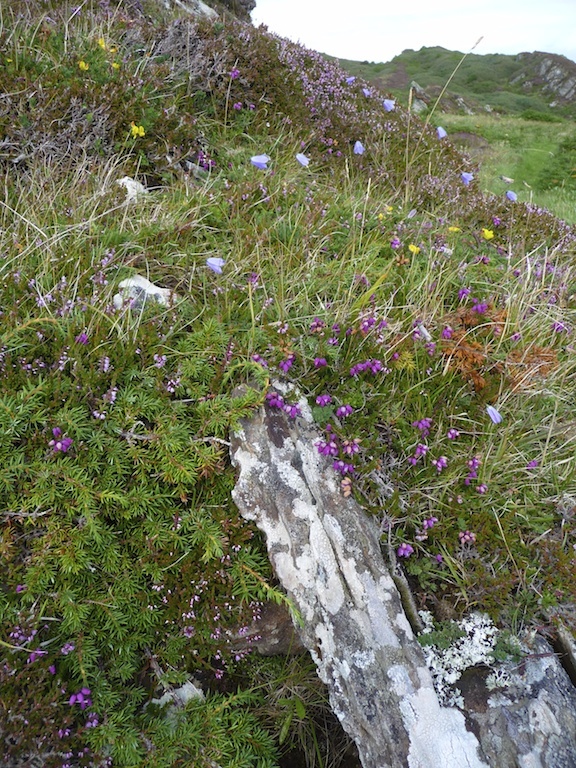 In Scotland it is found from the Borders right up to Orkney, but is most common in the Highlands. There are two sub-species: the prostrate form is ssp. nana, while ssp. communis makes a more upright, bush-like shape. 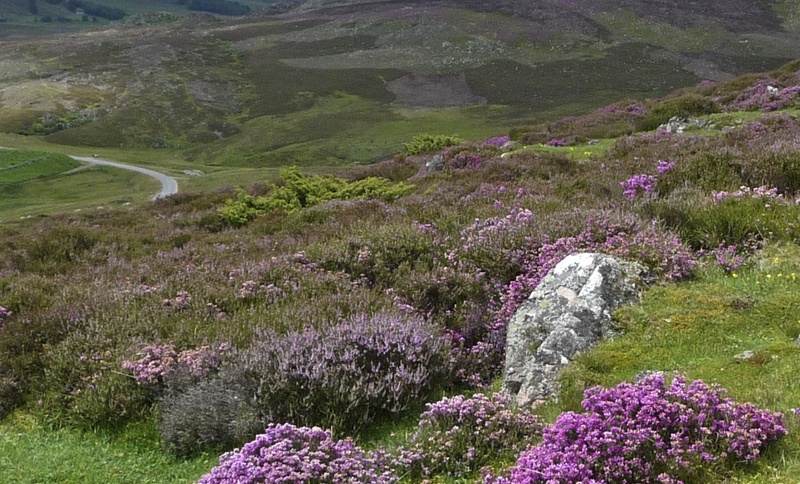 On our own travels we have noticed it most frequently along the shores of Argyll but also in the Cairngorms, where it intermingles with the heather to produce a vivid carpet of pink and green. A plant of acid soils and peat, you might think – but strangely it also grows on the chalk downlands of England, including the Chilterns and Salisbury Plain. A juniper bush can live for well over 100 years, and its cycle of reproduction is on a very long wavelength indeed. The plants are dioecious, meaning that they are either male or female; on the male plant, small yellow flowers release pollen into the wind, pollinating the pale green female cones which carry receptive droplets of fluid. It can take several years for these fertilised cones to darken into the familiar blue-grey berries with a dusky bloom and a deeply aromatic scent. These are eaten by birds – primarily migrant thrushes such as fieldfares and redwings – and once they have passed through their digestive system the seeds need to spend two cold winters in the ground before germination can take place. 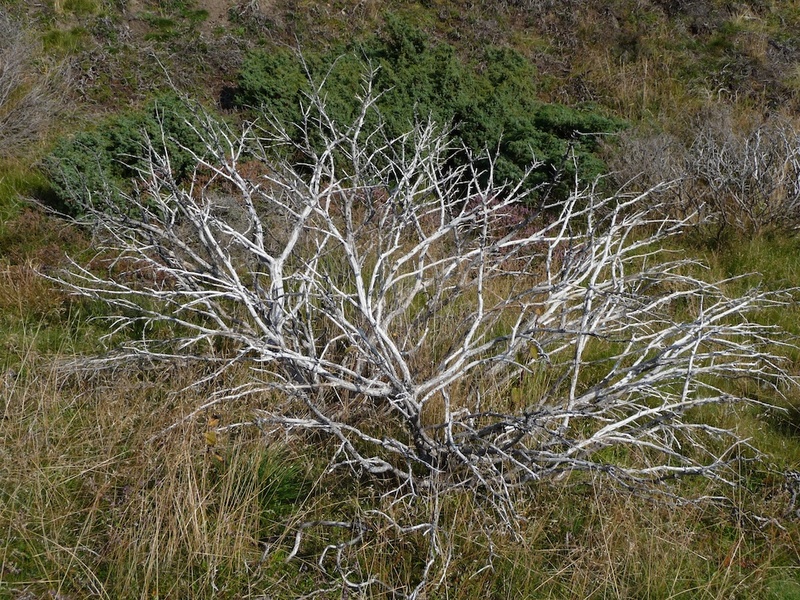 Because of the dormancy period, it seems that the ebb and flow of juniper distribution is influenced to some extent by weather conditions or temperature, so that some years may spark a ‘flush’ of new seedlings; curiously, it has been observed at some sites that a generation of exclusively male or female plants may occur in a particular season. The juniper may have a hidden agenda, but as the cover dwindles and becomes split into increasingly distant groups, this phenomenon certainly isn’t helping its long-term prospects. Many bushes seem to be dying of old age without having reproduced in sufficient numbers to sustain the population. 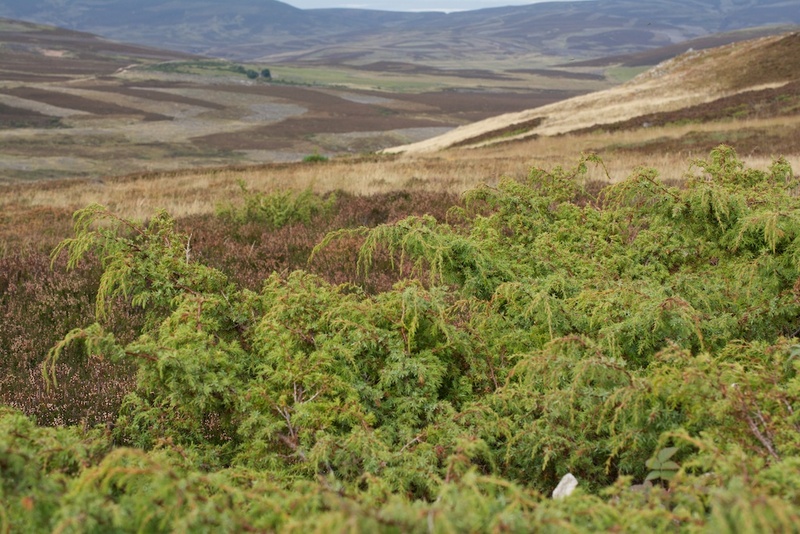 A paper published by Plantlife in 2015 contained a wide-ranging report on juniper distribution in Scotland. Habitat loss and over-grazing are threatening its welfare, and the arrival of a disease called Phytophthora austrocedri, which infects the bush through its roots, is now causing major concern. 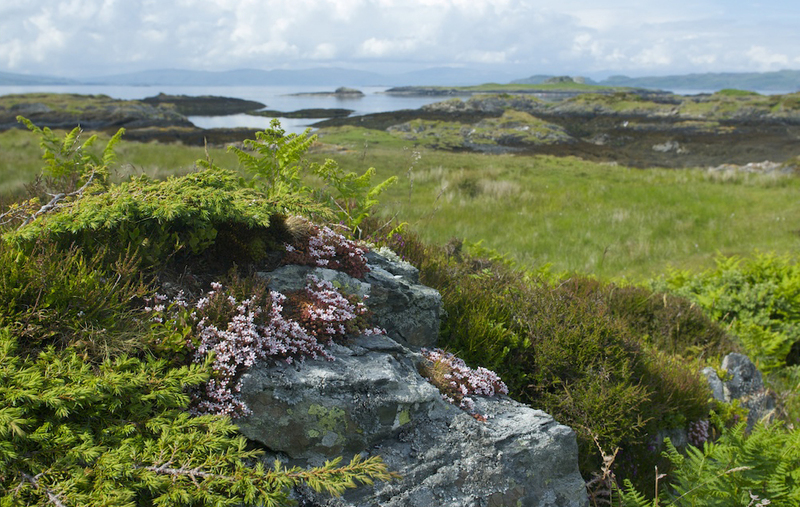 There are new management programmes in place to protect the remaining populations, and meanwhile Trees for Life is continuing to plant juniper as one of the many native species included in its forest regeneration projects. 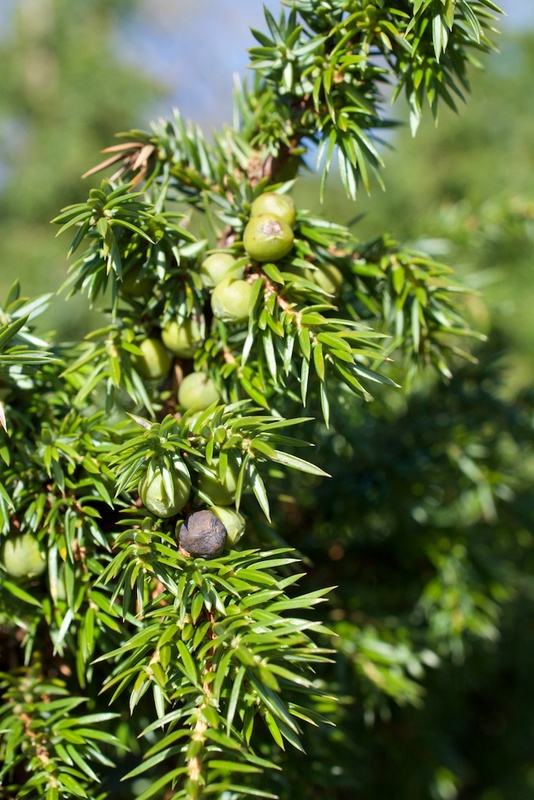 Juniper has been called the ‘mountain yew’, and one source suggests that this may well be the origin of the Gaelic word ‘iubhair’, meaning ‘yew’, in some place names, rather than the yew tree itself. However, its leaves are nothing like those of the yew, which are quite soft and blunt-ended: juniper needles are like tiny daggers, guaranteed to give you a nasty shock in bare feet! Red deer are not put off by the sharp needles, and will happily graze on the younger plants. On a smaller scale, its leaves provide sustenance for many moth caterpillars, among them the juniper carpet moth, the juniper pug and the chestnut-coloured carpet. 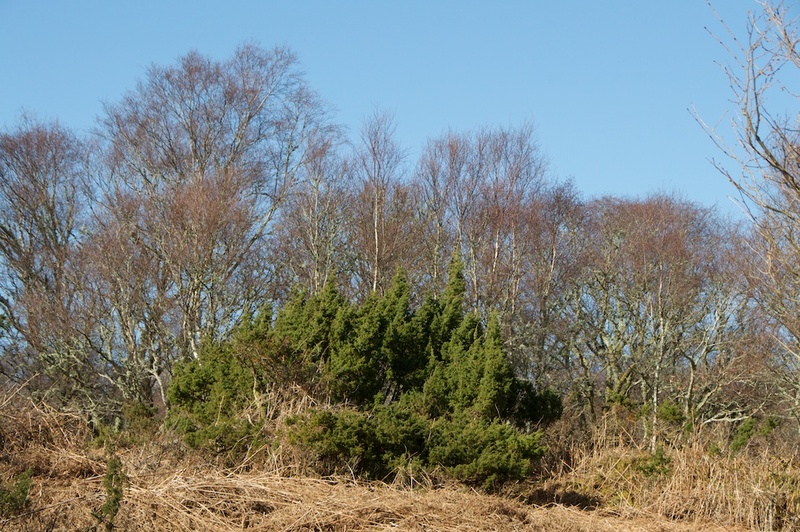 Juniper bushes offer cover for nesting birds such as goldcrest, firecrest and black grouse, and the dense prickly mat helps to shelter seedlings of other trees. Traditionally, juniper berries have been used for flavouring sauces, stews, and even cakes, and when mixed with wood shavings they give a wonderful aroma to smoked salmon. They are, however, best known for lending their distinctive fragrance to gin, whose name has a common origin with the word ‘juniper’. A couple of small distilleries are now producing gin flavoured with Scottish juniper berries, harvested in sustainable quantities. These include Crossbill Gin from Aviemore, which blends juniper berries and rosehips; and RockRose, made by Dunnet Bay Distillers from juniper berries in Caithness. As a natural remedy, juniper berries are imbued with a wide range of properties, having been used to treat everything from rheumatism to typhoid. They have antiseptic qualities, and during the Spanish ‘flu epidemic of the early 1900s it was found that spraying a vapour made from juniper berries around hospital wards would limit the spread of infection. In Scotland, Cornwall, and some parts of Central Europe there was once an age-old tradition of burning juniper wood at Beltane and on New Year’s morning, to rid houses and cattle of evil spirits. A juniper sprig was sometimes burnt next to the bed of a sick person, although in Iceland it was considered bad luck to bring both juniper and rowan into your house at the same time. The smoke of juniper was believed to aid clairvoyance. Interesting read…I enjoyed that. Asked to describe Juniper my first reaction would be to say its a shrub or bush but as you point out it is a tree. But interested in your comment about native Scottish trees Juniper, Scots Pine and Yew…no argument there but I seem to recall when being told about native species that these were determined by seeds that were known to have been in the ice after the big melt and that Silver Birch was there alongside the Pine…there for one of the native species. True.. and I was not trying to contradict you…… just flying the flag for Silver Birch often a tree that is taken for granted. As for native and none native I do feel somewhat at odds with conservationist who seem to want to restrict our woodlands by removing trees species that have been here for centuries on the basis that they are none native. Locally we have lost the strength of habitat in one woodland, a woodland where we hade all 3 Woodpeckers (Lesser, Greater and Green) unique in this region of the UK. They had been there for as long as most folk could remember. ‘Experts’ dictated that species should be felled to rid the wood of none native….now no Woodpeckers apart from Greater and those are a rare sighting. No, I do understand! 🙂 I love birches, so delicate and graceful, and beautiful in winter too. That is a real shame about your local woodlands – do you know what particular species were removed? It’s a very delicate issue, this turning back of the clock to a specific point in time – I can appreciate and fully support the sentiments but it’s not quite as easy as we would sometimes wish. Sycamore is the prime candidate for the chop…..but opinion on that are now mixed. Last I read at the Woodland Trust and others was that Sycamore actually supported more species than originally thought, very few of the seeds reached fruition but added to the food source for insects, birds and small mammals. Control of the few seeds that germinated were easily tackled and Sycamore should be thinned only as a part of a whole woodland scheme. Larch were also removed. I am a fan of the Oak (with a name like mine what do you expect!) but find it both odd and boring that it is the first choice and sometimes only choice for the replanting. I will not bore you with more of my conservation grips other than to say that I have been closely involved with National and local Conservation Organisation for many years and their policy decision making but fear that over the recent past science seems to blinker the thought process of common sense. That and the actions of major landowners with shooting interests seems to be creating more of a bland habitat over large areas of our countryside. I wondered if it might be sycamore. I always feel that trying to reverse the centuries of human impact on the countryside is like dropping ink into water – you can add more, but you can never get it back out. Thanks for this. Junipers are so important; their root systems prevent soil erosion, for one. Without them, no more hiking in the Highlands. That’s very true, and I had often overlooked them myself. Thanks for your comment! Fascinating. I’d never thought of juniper as a tree, and knew it only for the gin connection! I’ve learned a lot too, Viv! I was only vaguely aware of juniper and I wouldn’t have been able to name it among our native trees until recently. So nice that they are making gin from Scottish juniper, too! Love the scent of juniper and the way it subtly blends in to the world around it. Yes, that’s true, Ruth! It makes a lovely tapestry with the other ground cover plants. Wonderful photographs, Jo. Juniper seems to grow in some beautiful places, perhaps it enjoys a good view. I knew virtually nothing about it before reading this article, not even that it was a native species, so I feel I’ve had a bit of an education. Thank you for that and for yet another excellent post in your always interesting tree series. Thank you, Lorna, and I enjoyed finding out about the juniper (as I have about all the others!) It certainly does inhabit some fabulous places, you’re right. The top pic was taken on Seil island, and two of the others on the Garvellachs. You couldn’t ask for a more beautiful view! I hadn’t realised that the Juniper was a native to Britain. 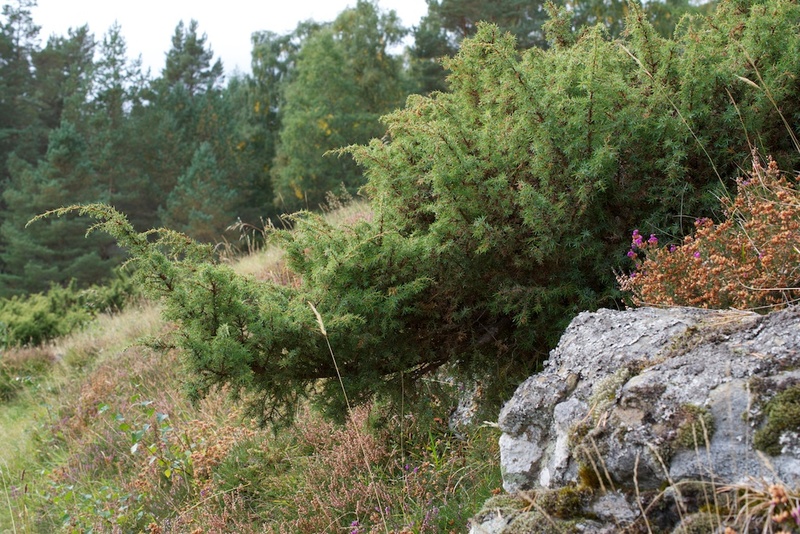 It would be sad to see Junipers disappear due to disease and mismanagement of the land, hopefully the fact that this is now known, will provide the impetus to save and re create suitable environments for this amazing tree. Thank you very much, Andy! I agree – I hope that the juniper and its habitat can be saved, because it’s such an important component of our landscape.